Director of "Dead Man" and "Year of the Horse"
UPDATE: Also, see Neil Young News: Jim Jarmusch & Neil Young. Director Jim Jarmusch's film Dead Man with a Neil Young soundtrack is considered by Greil Marcus in Salon Magazine to be "the best movie of the end of the 20th century." Among reasons that Marcus cites are: "For a film set more than a century ago, an electric guitar, playing a modal melody, surrounded by nothing, sounds older than anything you see on the screen." Jarmusch's concert film of Neil Young and Crazy Horse from the the 1996 tour has been called: "A concert film-group portrait that captures as well as any other music movie the natural, untethered essence of live rock." by John Anderson, in the LOS ANGELES TIMES. "For "Year of the Horse", his documentary about a Neil Young concert tour, Young himself suggested the project after he had written the music for Dead Man and they had made a video clip for his song Big Time. "Young said: 'Look, I'll pay for it. Just shoot some stuff and see if you like it, and we'll continue if you do, and if you don't, I'll just put it on a shelf somewhere.' How could I refuse that? And it was a really great experience, because there was no road map at all." "I remember we didn't want to edit down any of the songs in the movie without Neil's help, because it's his music. "So he came to New York to help cut, because the songs were all, like, 14 minutes long. We showed him the Like A Hurricane number, which right in the middle of the song cuts from him now to him 20 years ago. "We were laughing so hard, but he was deadly serious. He wasn't self-conscious about his own image changing, just 'Look at Old Black. I haven't taken good care of her.'" But Jarmusch gets serious when he says, "If Neil were a native American he would be a 'contrary' -- a medicine man. He'd have to walk backwards, because everything Neil does is contrary to what is natural. "Neil is a perfectionist who embraces imperfection. Everything he does is like that, and the more you get to know him, the more you see it in him. "Jesus, he doesn't even dress like a rock star. He dresses like a garbage man. He doesn't care." 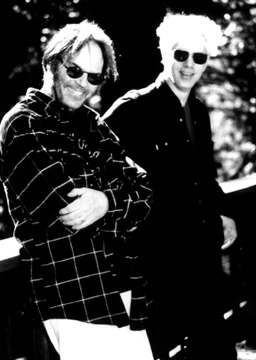 Jarmusch and Young have agreed to reunite in 2006 to film Crazy Horse on tour. And they're serious. I wonder if Jarmusch ever got tired of Crazy Horse's music, considering he must have spent hundreds of hours listening to the band while making the film. "No, I never did," he says. "They are very transporting. They pick you up and lift you into the sky. The sound is so big and beautiful. I don't know why, but I don't get tired of listening to them." More on Neil Young & Crazy Horse in "Year of The Horse" and Neil Young's soundtrack for Dead Man film. Also, for more on Jim Jarmusch's films, see interview on directing Neil Young and Crazy Horse in a concert film.